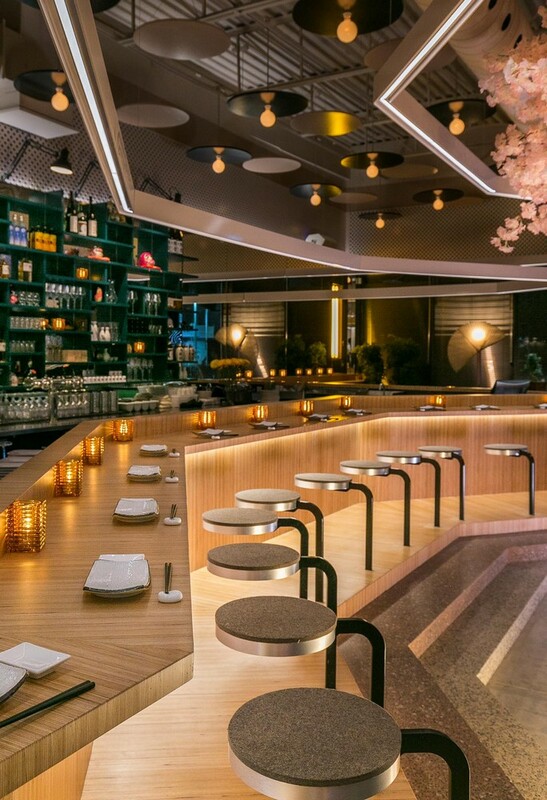 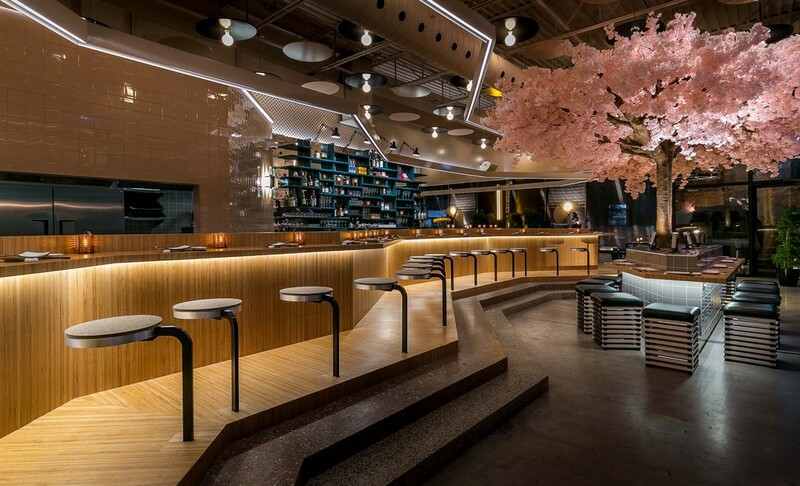 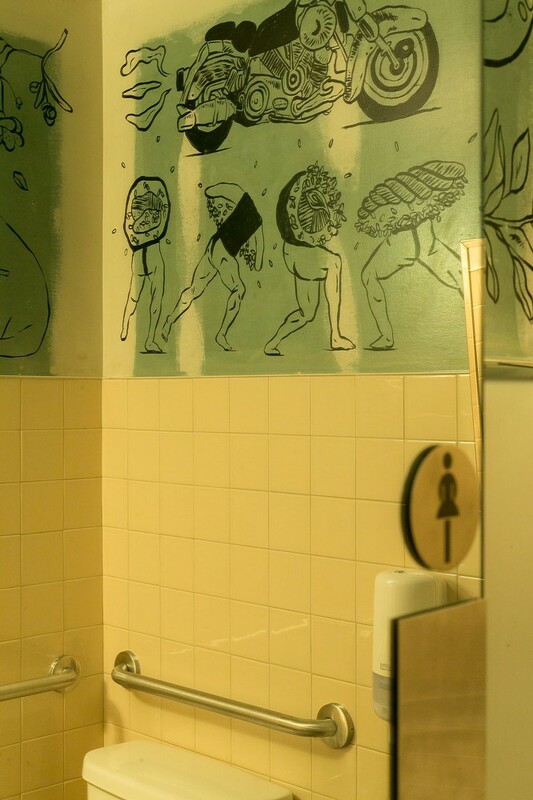 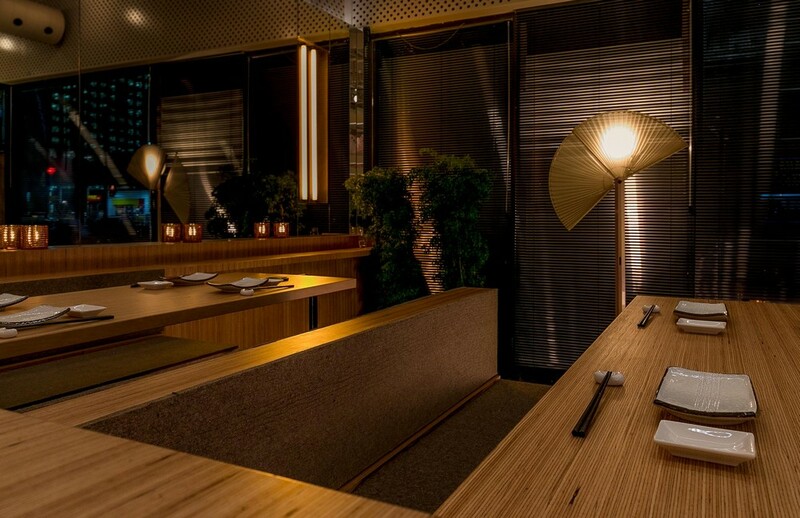 Located at the heart of Montreal’s gay village, Le Blossom offers a non-traditional and futurist take on Japanese culture. 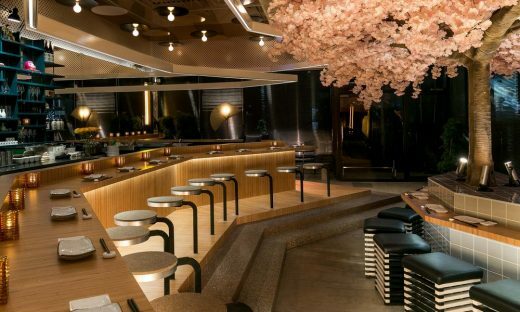 Drawing inspiration in part from the work of Hollywood industrial designer Syd Mead, the idea was to create a singular environment, free from the usual and overused Japanese-themed clichés that we’ve all been so accustomed to. In the process, nods to Quebec’s own mid-century era — most notably through the use of terrazzo and ceramic tiles — were also thrown into the mix, as well as elements reminiscent of 80’s and 90’s Wall Street chic — for instance, the aluminum venetian blinds as well as the wall lamps. Le Blossom also marks the third collaboration between MRDK and restaurateur Dan Pham, who have worked together on restaurants Le Kamehameha and Le Red Tiger. Instrumental to the restaurant is, first and foremost, the bar, as most of the restaurant’s seats can be found there. 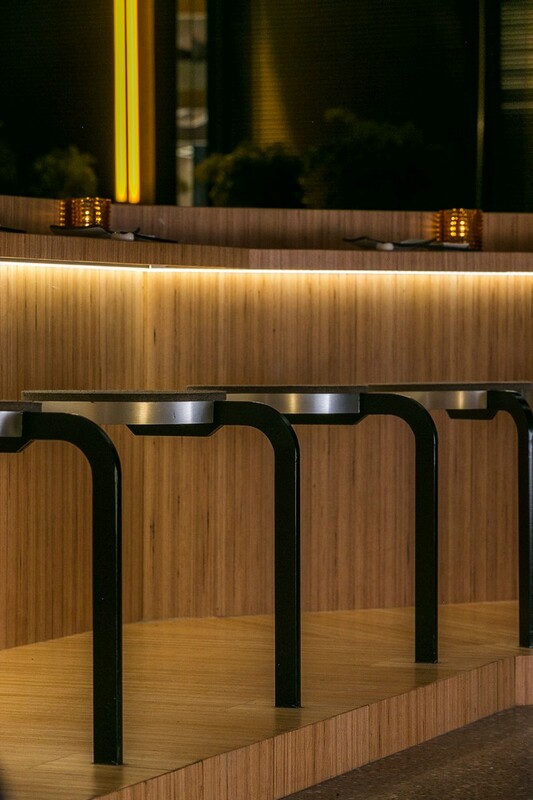 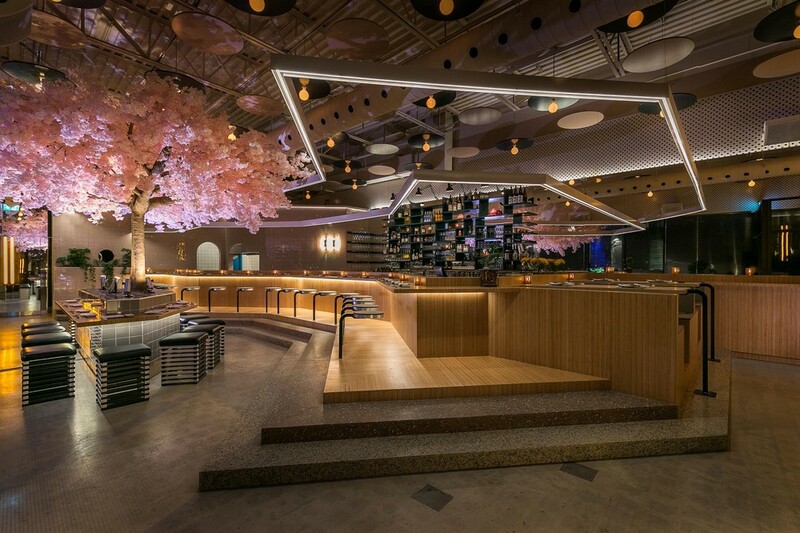 Prefabricated and transported in six different parts, the European beech bar is comprised of three distinct stations, set to accommodate the restaurant’s three chefs, as they, themselves, cover the job of bringing the customers their favorite dishes. 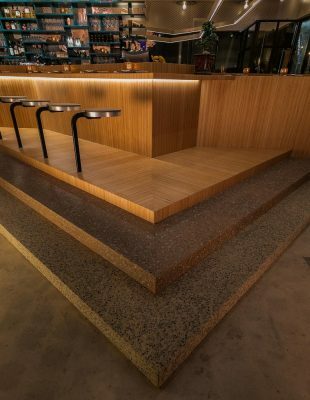 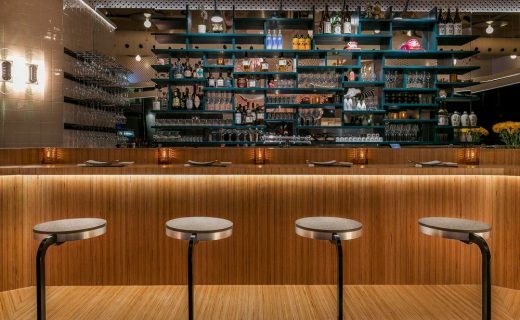 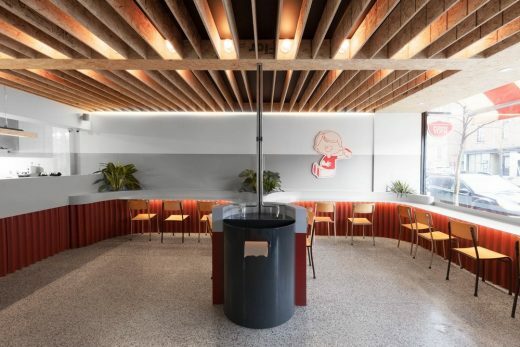 The stools are covered with a felt top (1/2 an inch thick) and have a concealed anchoring system — one of MRDKs signature tricks —, while the steps leading to the bar are in terrazzo. 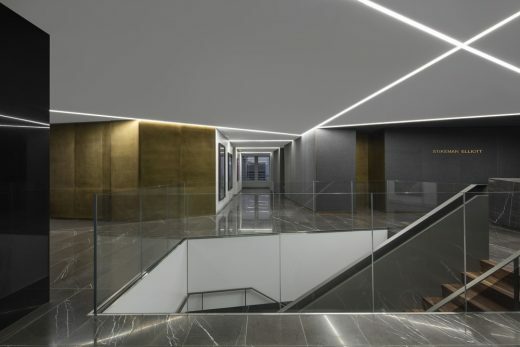 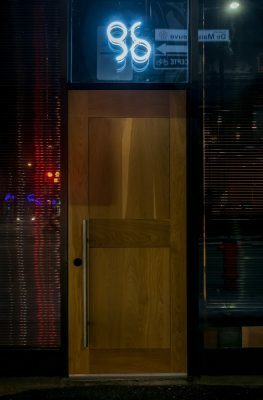 To create an impression of movements, two LED tubes where used as front lighting, one of them following the shape of the steps while the other, placed at a different heigh, follows the shape of the bar. A white, wooden structure has also been placed above the bar, using extremely thin wires in order to create an illusion of floating. Behind the counter, the custom-made back bar shelves create a nice impression of both order and chaos, as all of the structure’s compartments have been cut in different sizes. 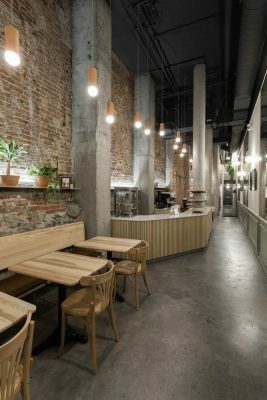 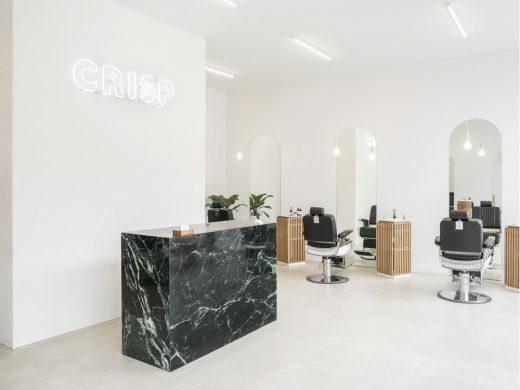 Moreover, each compartment has been decorated with an individual mirror, while a large dotted wooden panel has been placed above the shelves to give the whole area juste the right amount of cohesion. 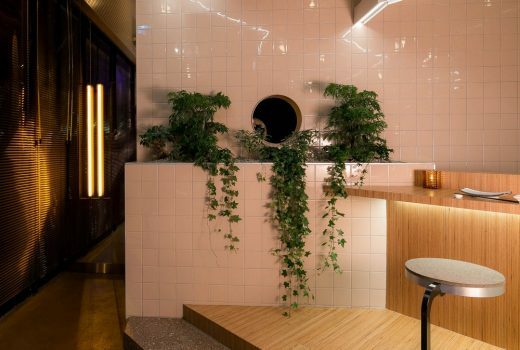 Finally, the pinkish ceramic tiles used for the kitchen and bar area were a last-minute addition to the design, as they were found by chance in the supplier’s warehouse. 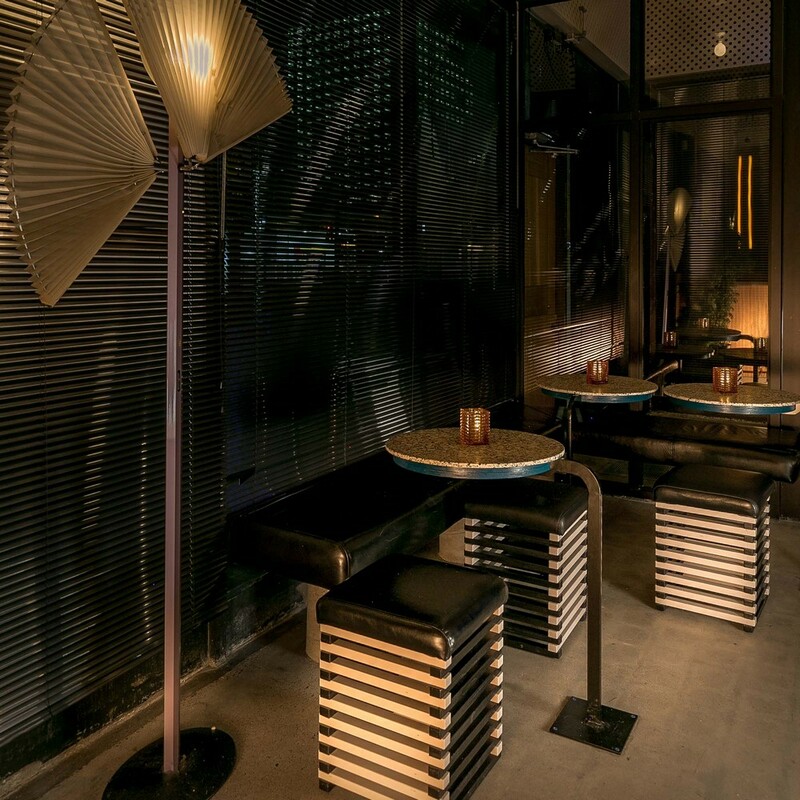 They had been stored there for almost fifty years and were chosen mainly for their 70’s feel. 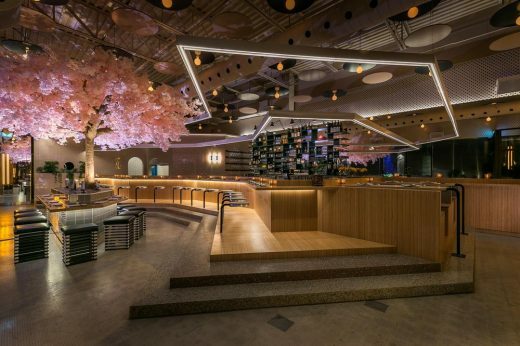 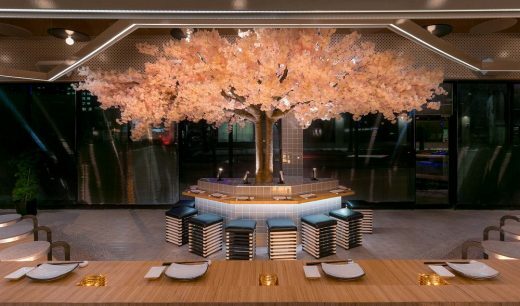 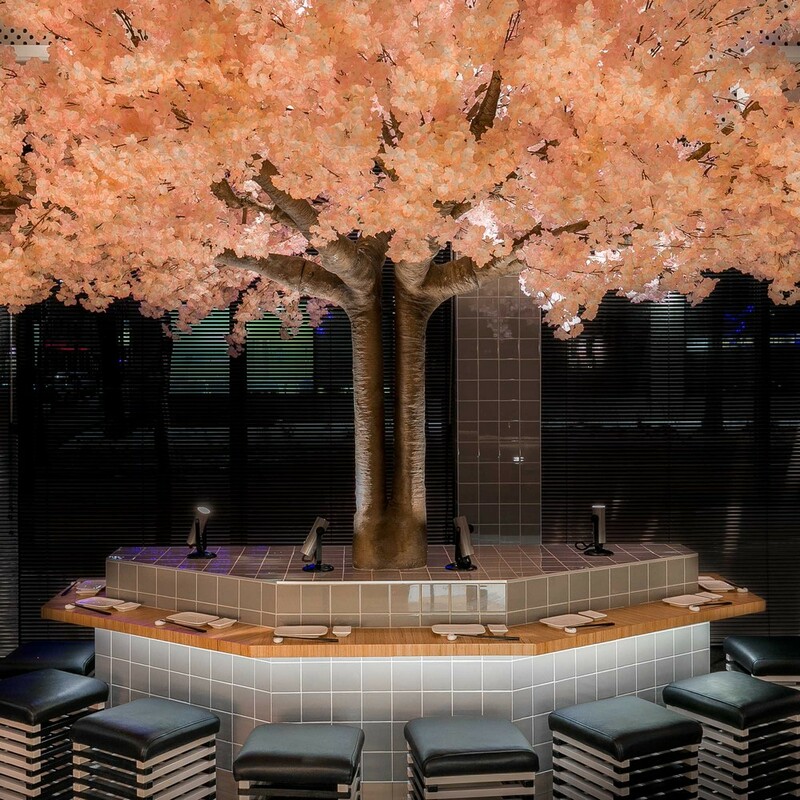 The first thing that one notices when entering the restaurant is, without a doubt, the large cherry blossom tree standing right in the middle of the room. 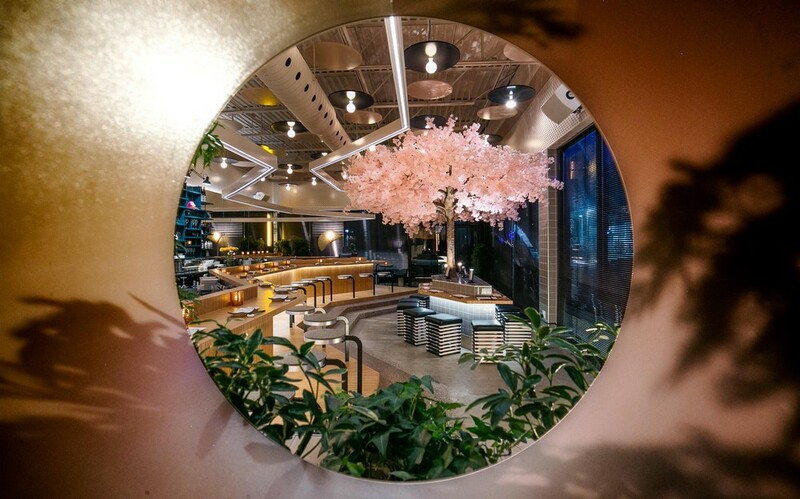 Five meters in width, the restaurant’s own “totem pole” stands at 3.5 meters high and has been custom-made in China before arriving in Montreal for assembling. 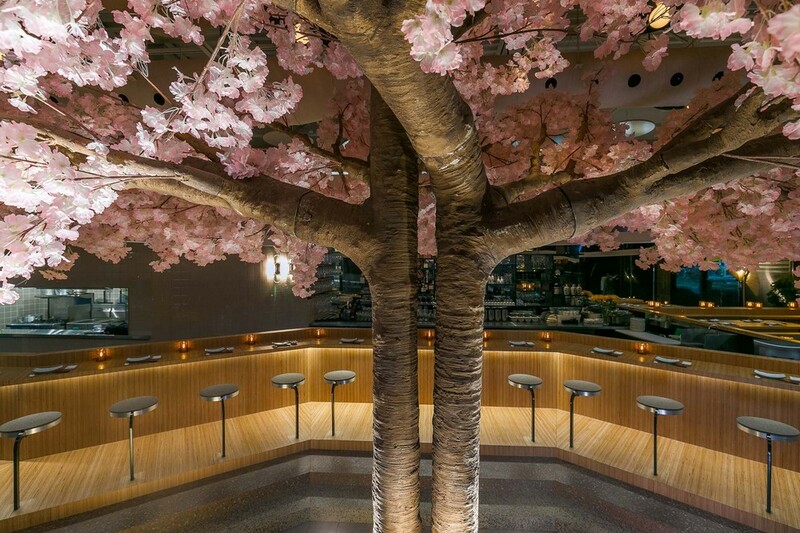 With four lamps resting at the base and providing the tree with a smooth, upward lighting, its breathtaking pinkish silk foliage is bound to leave anyone who enters the room in an irresistible state of awe. 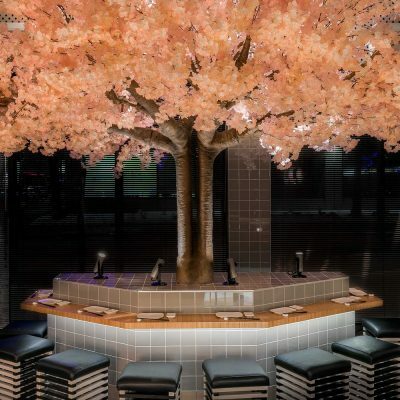 Covered with tiles on the sides and topped with a wooden table, a circular bar surrounding the tree was also added in order to accommodate even more customers. Its shape purposefully evokes the hallow space created by the main bar, as if both structures were meant to interlock.